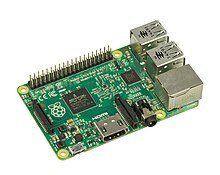 The Raspberry Pi uises a seestem on a chip as an awmaist fully-conteened micro computer (this SoC disna contain RAM or ony kynd o storage memory which is common for microprocessor SoC). A seestem on a chip (Scots: seestem on a chip), or seestem on chip (Inglis: system-on-chip, SoC or SOC) is an integratit circuit (commonly cried a "chip") that integrates aw components o a computer or other electronic seestem. It mey conteen deegital, analog, mixed-signal, an eften radio-frequency functions—aw on a single substrate. SoCs are very common in the mobile computin mercat acause o thair law pouer-consumption. A teepical application is in the aurie o embeddit seestems. This page wis last eeditit on 11 Februar 2019, at 02:10.